Even though many families actively try to steer away from eating in the living room, it is inevitable that your family is going to want to snack while watching the latest blockbuster. While snacks and tasty beverages aren’t exactly a problem by themselves, a lack of a sturdy surface to place them on can spell disaster for your living room. Having a strategically placed occasional table or two, is an easy way to ensure that those drinks and snacks have a place to rest when not in use. Occasional tables make a great place to sit items you don’t feel like holding while you relax. 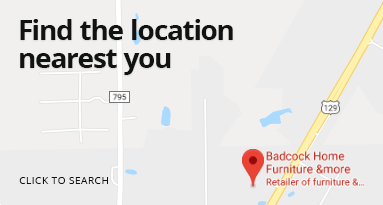 Badcock can help you find coffee tables, side tables, and other occasional tables to flawlessly match your living room décor while giving you sturdy and functional table options for your living room. Plus, you can trust our incredible financing to ensure that you get the look and functionality you want. Get the perfect item to showcase all your accent pieces when you purchase this gorgeous console table from the Anastasia Collection. It’s grey trim and inlaid mirror frame is perfect for presenting your smaller decor and beautiful enough to stand on its own as well. Looking for more elegant furniture like this? 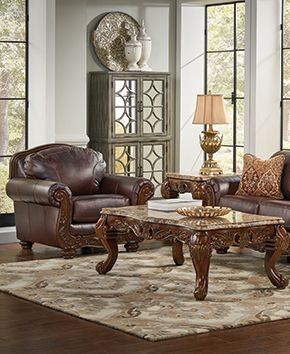 Check out the rest of the Anastasia Collection and infuse upscale charm throughout your living room. Add a splash of sophistication to your living room’s decor with this regal end table from the Anastasia Collection. 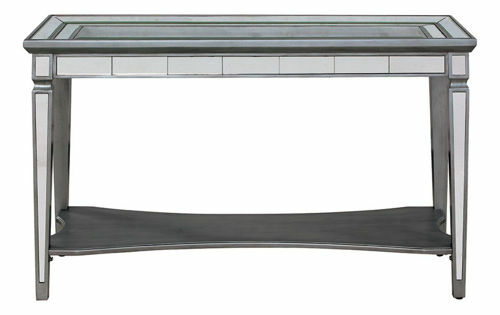 With an inlaid mirror frame and grey trim, it is the perfect accent piece for your home. Take a look at the other items from the Anastasia Collection today and turn your living room into the ultimate interior decorating statement. This 12-piece table and accessory group features a faux granite-topped coffee table with wood legs and two matching end tables. A pair of complementary lamps as well as a vase, tray, pair of candleholders and decorative sphere are also included. This metal and glass coffee table set serves up a simplified look to satisfy your sophisticated taste. 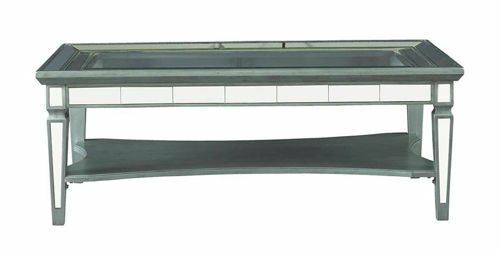 Cross-bar stretcher design is striking and accompanied with clear glass tabletops giving an open and airy aesthetic. 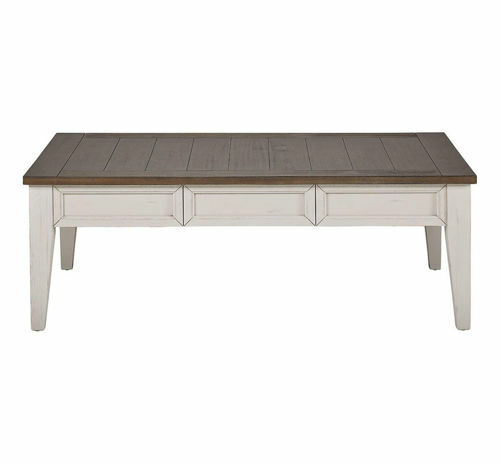 This table harmoniously blends elements of contemporary and cottage styling to create a modern farmhouse look. Featuring a two-tone finish of antiqued white base with a dark oak top, spacious drawers and a simple yet refined aesthetic, this table is perfect for putting your feet up after a long day or showcasing your favorite books. Pair it with the Briarwood end table to complete the look! When decorating, it’s important to look at both the great design elements from both the past and present. The Briarwood Collection marries the styles of yesterday with those of today by featuring a two-tone finish of an antiquated white base with a dark oak top. This classic yet modern collection will update your living room while still matching your existing decor. With a mix of modern and farmhouse style, this end table from the Briarwood Collection will make a great addition to any living room. 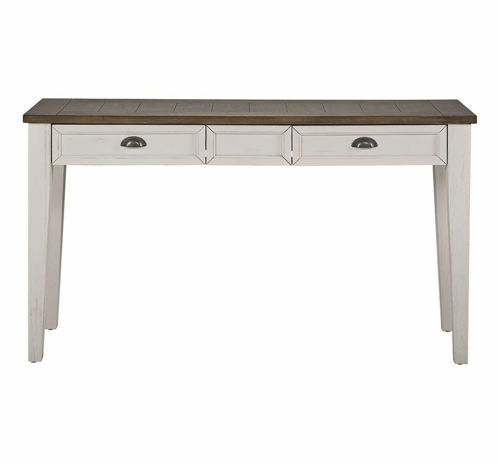 Its two-tone finish of an antique white base and a dark oak top is simple yet striking, and its ample drawer space provides optimum storage. Effortlessly complete your living room with our exquisite Cameron table set and matching accessories. The 12-piece set includes a coffee table, two end tables, two table lamps, two candleholders, a complementary photo frame and one tray with three decorative spheres. The tables are constructed of metal, glass and poly-resin with a black finish that adds a sharp and dignified flair. Great as part of the Canton Heights Collection or on its own, use this beautiful mahogany solid cabinet table to keep the clutter out of sight. 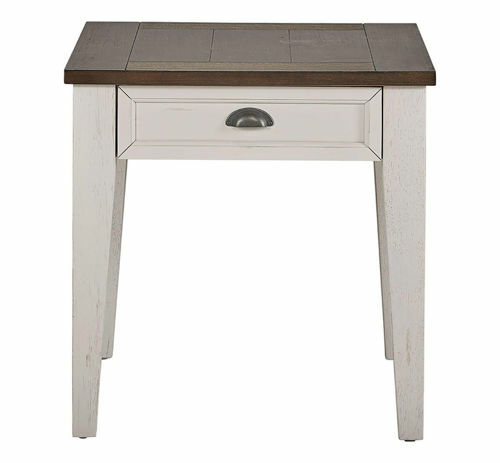 A beautiful add-on piece to the Canton Heights Collection, this sliding top storage table offers convenience and style. Made with beautiful mahogany solids, you’ll love how it looks and how effortlessly you can add extra storage space. This detailed transitional chairside table is crafted of Birch solids and select Birch veneers in a rich dark chocolate finish and paired with natural slate inserts. The bottom shelf is perfect for added storage and the sculpted legs help complete the stylish look of this must-have for your decor. Please ask about our Furniture Protection Plan. Crafted with Birch solids and select Birch veneers with real slate inserts and finished in a rich dark chocolate with slight distressing. Accented with black metal tie straps on the legs and aprons. English Dovetail on all drawers and full extension drawer glides for smooth opening and closing. Please ask about our Furniture Protection Plan. This detailed transitional coffee table is crafted of Birch solids and select Birch veneers in a rich dark chocolate finish and paired with natural slate inserts. The bottom shelf is perfect for added storage and the sculpted legs help complete the stylish look of this must-have for your decor. Please ask about our Furniture Protection Plan. This detailed transitional end table is crafted of Birch solids and select Birch veneers in a rich dark chocolate finish and paired with natural slate inserts. The bottom shelf is perfect for added storage and the sculpted legs help complete the stylish look of this must-have for your decor. Please ask about our Furniture Protection Plan. The Canyon Cove magazine rack is made of birch solids and veneers and has natural slate inlays. Also matches the Canyon Cove table collection. This trunk coffee table features left and right side slide out tops and central lift top for ample segmented storage below. Crafted with Birch solids and select Birch veneers with real slate inserts and finished in a rich dark chocolate with slight distressing. Accented with black metal tie straps on the legs and aprons. English Dovetail on all drawers and full extension drawer glides for smooth opening and closing. Please ask about our Furniture Protection Plan. Entertainment becomes more enjoyable with the beauty of this smartly designed media console. It features a v-matched, fancy-face veneer top, three full extension drawers, two shelves and two doors with a shelf behind them. It measures 62” wide, easily accommodating TVs of most sizes. The classic look of the Chambers end table offers superior style and added storage space. Perfect for display of decorative items or for practical storage use, it features a v-matched, fancy-face veneer top, book-matched veneer side panels, a full extension drawer and a shelf. Enjoy a polished look combined with seemingly endless storage possibilities. This unique coffee table features a v-matched, fancy-face veneer top with four full-extension, side-guided drawers. The top lifts up to reveal added storage space. Pair your recliner or accent chair with this handsome table crafted from poplar solids and features a hand-inlaid parquet diamond pattern. Flared legs connected by a bottom shelf complete the look. The 18”x24” footprint is ideal for convenient placement next to a chair. The intricate design of the surface of this charming coffee table is sure to make it a conversation piece amongst your guests. The table is crafted from poplar solids and features a hand-inlaid parquet diamond pattern. Flared legs connected by a bottom shelf complete the look. 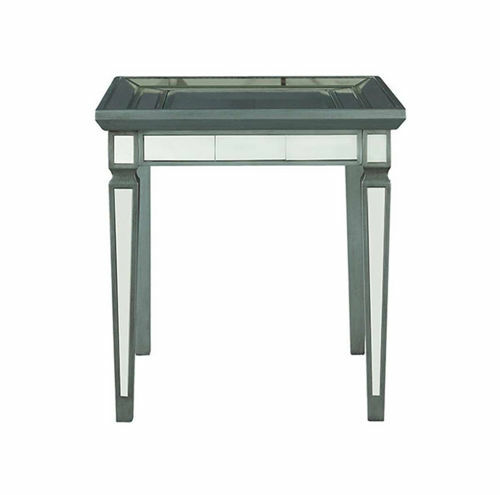 This console table gives you the perfect spot to display that special vase, sculpture, lamp or even picture frames. It is crafted from poplar solids and has a hand-inlaid parquet diamond pattern. The size is designed to fit neatly behind a sofa. Flared legs connected by a bottom shelf complete the look.